More photos are now available on www.altoturiaride.net and also on www.rallyteambdm.nl (the BMW riders site). They give a good idea of the prologue and some of the more nadgery going. Last year's event was so good, I just had to go back. I couldn't find anyone else who had the time, money or enough browney points to travel with, so I just had to go alone! I took the wheels out of the 525, and crammed it, and all my kit into the little Citroen C15 van and off I went. The Thursday night crossing to Le Havre was uneventful, and I then spent a fairly relaxed two days getting down to Arras Rural. I stopped over at Oleron St. Marie on the French side of the Pyrenees on the Friday night, where I met a gang of sportsbike riders who had had a couple of days of high speed thrashing around the mountains. One of them had a video camera mounted on his tank where you could see the speedo in the corner of the picture. The recording is best described as highly incriminating! I arrived at Arras Rural on Saturday afternoon and found Malcolm already set up with his companion Stella, and also several of the Brits from last year who were back down for another go. Also at Arras, were a large number of BMW GS's who were gathering for a celebration of the 20th(?) anniversary of the BMW GS. 400 or so came and went over the weekend. There were a couple of trail rides organised for them, Touratech had a stand there, and quite a few were seen riding around on the motocross track at the back of Arras Rural. GS's don't seem to crash, they capsize! Sunday: Prologue. This was very similar to last years, just run backwards, so it started off at the back of Arras Rural, where there are a number of obstacles – a rock pile, a water hole, a sand pit, corrugated obstacles – arranged in the mini motocross track. The course then disappeared off up a very rocky track, down into a valley and up a very steep long hill climb strewn with rocks. This, and the daily 'specials', was timed to determine the daily starting order, slowest first (It's not a race you understand!). I took my time and came in 16th (of 44). 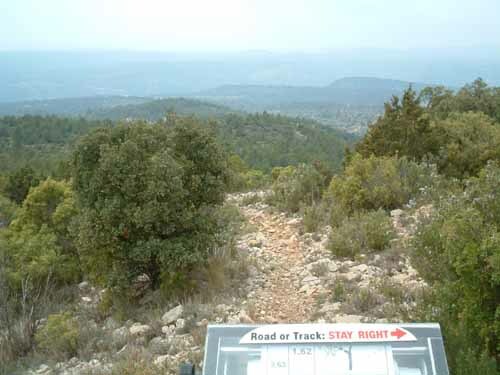 Monday: Higuerulas - 242Km : Different route this year, rocky tracks, mountains etc., but with a similar 'special' which ran through olive groves and up to a quarry. This test was marked so no navigation was required. I went a bit quicker on this one and ended up 10th. 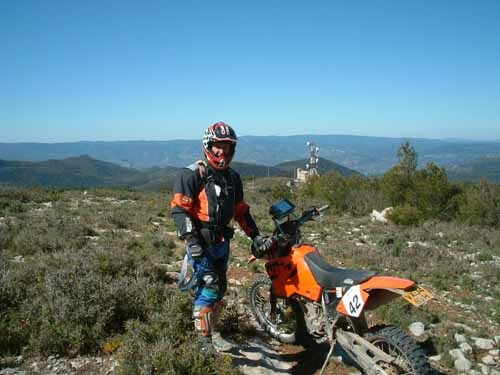 Tuesday: Albarracin – 270Km : Different again to last year, basically running in reverse, with a new 'special' which consisted of three laps around a motocross circuit which makes Cwmythig look flat! This was run is groups, four in mine, but timed. Maintained my 10th position. 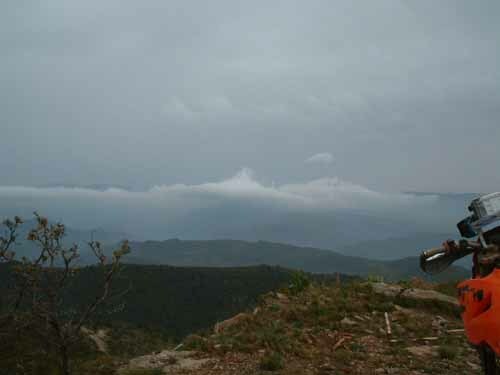 Wednesday: Javalambre – 242Km : The 'special' was very early in the day, ending up the top of Javalambra, one of the high mountains. This was definitely a navigation test, with quite a few losing their way, and a lot of time in the process, but I concentrated on navigation to put in a good time and move up to 6th. 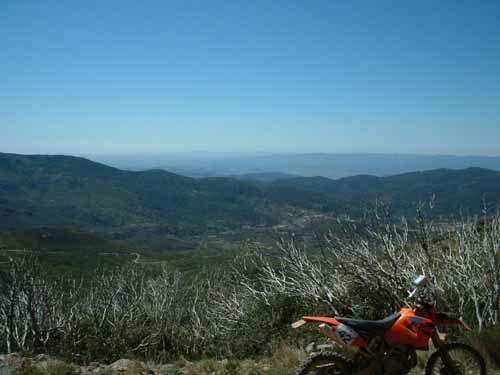 This day is particularly good, as much of the going is off the dusty forestry tracks on greener mountain tracks. Good views too! Thursday: Cuenca – 315Km : This was the long day which included a fast thrash of a 'special' partly along a track which had some rather scary drops to catch the overenthusiastic. I chickened out a bit here and dropped to 7th! It's a good long day this, with loads of fast going on various terrain, from high mountains to fairly flat farmland. Friday: Manzanera – 186Km : Shorter distance for the last day, but including another navigation 'special' which again caught out quite a few (to my advantage!) and I moved back up to finish 6th overall. Hurrah! The route this day included a high mountain section with excellent views, and ended up at the old nunnery - Ermita de Sta. Catalina - now a picnic area, overlooking Arras de Los Olmos and Arras Rural. While we rested, Malcolm went for a short spin on the MXC. He later said that it probably was a bit too powerful for trail riding - it is a bit of a 'lively' beast! After a few beers, it was a short and gentle ride back to Arras, where we partly dismantled the MXC and stuffed it back into the van ready for the return. The evening saw the 'award' ceremony where I got a medal and a jar of olives for my efforts! The jar had an 'Alto Turia' sticker on it! The first two days were a bit harder than last year. This didn't cause a problem for those on pukka enduro bikes, but many of the riders on bigger bikes had quite severe problems, particularly on one of the long rocky climbs, which had more than a passing similarity to Pant-Glas – just much longer and looser. Fancy riding a big GS up Pant-Glas anyone? Last year we had a couple of days rain which kept it cool and kept the dust down. This year was hot and dry – very pleasant – just so long as you weren't following someone. For this reason, I found that I spent a lot of time on my own which made navigation a much more important, and enjoyable, part of the experience. The 'going' is mostly tracks, the surface of which ranges from soft sand to gravel right up to rocks and boulders in places, so always a challenge, and for most of the time, the tracks are either going up a mointain or down the other side! The roadbook supplied is pretty good and has to be 'believed'. There were a couple of places where directions were a bit uncertain, but if junctions and features were ignored that didn't appear in the roadbook, it always worked out. This included one place where 100m of track had been ploughed up (ride down edge of field! ), and another place where a fence had been erected (lift wire – ride under!). A few more entries than last year. Still a very friendly atmosphere, but one big difference was that the organisers last year held riders at checkpoints until all had arrived or been accounted for. This meant a fair bit of hanging around. This year they had more organisers out on the course which meant that riders could just keep going which was far better. This spread the field out so that it was easy to ride apart instead of in one great cloud of dust. 13 Brits, 3 Swiss, a Belgian (? ), 17 Dutch (including the brave BMW riders), 3 Germans, 6 Spaniards and 1 Portuguese rider made up the field. Classes were Monocylinder - Enduros (30), Multicylinder - Enduros (7), Lady-riders(1) and Grand Old Men (6). Thanks to Malcolm and Stella for running around in the Citroen with my fuel. Luckily I managed to stay on and got through the week without breaking myself or the bike so all I needed at stops was fuel and a drink. After any event, there is just the normal desire to get home quickly, so I left Arras Rural at 8am on Saturday and arrived at Le Havre at midnight, 16 hours and 850 miles later. I was pretty knackered! and slept with no problem in the front of the van, but woke up in the morning for my ferry with a door handle impression in my back. The Sunday morning ferry is always quiet, so I had a relaxed crossing , an easy drive home – a mere 150 miles – an early night, and then back to work on Monday for a kip, I mean for work!